I'm not sure what you're getting at....a bio-filter works the same whether it's a UGF or a power filter or a cannister filter or a wet-dry.....whether it's in freshwater or saltwater...whether it's nitrifying or de-nitrifying. It detoxifies ammonia.....optionally, breaking down nitrates as well. That's it. I know...we're kinda "off" in our terminology thanks in large measure to the marketing efforts behind dead rock...that perspective was the point of the 1965 quote. "Always" (as in your quote) is a short time frame for most of us....sometimes just a few days, months or years. You know what they say: "If you don't know where you come from, how will you appreciate where you're going?" I don't know how that comment explains all those trouble threads (10's of thousands of posts from hundreds of different members -- see links below) from the last few years that involve only dead rock. Today, you don't have to look far to find people with dry-rock related trouble. And the kinds of trouble are not in the same class as "troubles" that occasionally come with live rock. Dinoflagellates – Are You Tired Of Battling Altogether? alone has 300+ pages (6000+ posts) of people with dead-rock/toxicity issues. the old Dino thread (231 pages/4600+ posts) that the above thread displaced was long, but nobody got cured so you if you read, you get a few chances to see (as in pictures!!) the end-game in a toxic tank. Those two threads have over 10,000 posts just by themselves. On top of that, there are hundreds of individual dino threads on top of those two biggies which all track the same (bad) way. If you can find any cases of live rock in those dino threads I'd be surprised, but I'd still ask you add up all the cases to see that 99%+ of those tanks were dead rock tanks. I agree that would be so nice, but no it actually doesn't appear to be a matter of opinion. It's empirically observable and has a statistical likelihood...it's predictable to at least some degree. All we have today over that author from 1965 is a slight understanding of the problems. Dead rock ≠ Live rock. Dead rock = Seachem Denitrate/Matrix, Bioblocks, DIY rock, et al. I'm glad that every dead-rock tank isn't a death tank -- thank goodness! We can thank our slight understanding in 2018 for this. I tried to explain things pretty succinctly in my previous postings. You seemed to be arguing gravel to be the biofiltration of freshwater tanks as a support for the rest of your argument, when it's not. That's why I pointed out that freshwater focuses on other methods of filtration, because gravel itself is insufficient as it's not porous (like the rock we use in saltwater tanks) and doesn't have enough surface area for the beneficial bacteria needed to filter the tanks. 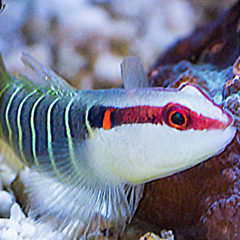 In current methods of saltwater tank-keeping, live rock (whether it started dry or came from the ocean) is the primary method of bio-filtration in saltwater tanks. We don't use sponges in saltwater tanks due to the propensity to trap detritus and become nitrate factories, and biowheels were being discouraged when I started because they also were thought to be nitrate factories (I distinctly remember c'est ma stating she'd only removed her biowheel a short time previous to starting her thread due to those concerns, and that was a good decade ago). So I could say right back to you that I don't know what you were "getting at" by saying we don't call the gravel in freshwater tanks "live gravel." 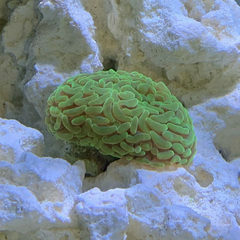 As I recall from my early days in the hobby, most people using dry rock were doing so partly for cost reasons and partly out of concern for the impact on the coral reefs that live rock harvesting was having. I remember people discussing a recipe for creating your own rock that I believe came from GARF. Concerns over the impact on coral reefs remain and may be even greater today. I don't think "marketing" really had anything to do with it, in those early days particularly. 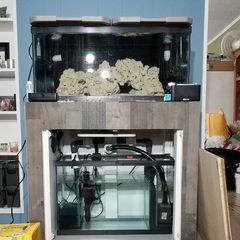 It was also very popular to use dry rock or a denser base rock in larger tanks and then just use premium live rock for the part that was going to be most visible. "Always" to me means since about 2007, when I started lurking on these forums and learning about the wonderful world of saltwater. When I saw "always" in reference to myself, I'm referring specifically to my own time and experiences within the hobby. Not sure why I need to explain this. Whether dry rock is inferior to live rock is, I think, a matter of opinion and will vary based on your goals and values. I would appreciate it if you'd make an effort to really comprehend what I and others are saying instead of reading with the goal of proving the other person wrong and showing your views to be superior. I enjoy a good debate. I do not appreciate being talked down to. The ignore list is a beautiful thing. I read all of it, and replied based on my understanding of what you wrote. If I was completely misreading it, well, I'm sorry about that. @LesPaulGtr, sorry your thread seems to have been hijacked. How is the cycling going? Are you still seeing nitrites? Hi @teenyreef No problem 🙂 Thanks for checking in. So I've dosed ammonia a couple more times since my last update and I'm still getting 0 ammonia .1 nitrites after 24 hours. If I wait another day, the nitrites do fall to 0. Not sure how to get that down to zero within a day after dosing and is it essential at this stage? I've got to be close, no? Also, my nitrates are sky high red color, I can't gauge on the API kit but somewhere between 80-160. Thanks again for any and all advice! I think you're really close! Normally in a cycled tank, nitrites get processed so quickly most people never see them. So technically you're not done yet. If it was my tank, I'd probably take a chance on a few snails just to see how they do, and then start doing some water changes to bring the nitrates down. But I tend to get impatient even when I know I should go slow. Thanks @teenyreef. I guess I'll keep at it and try to be patient 🙂 So I've been dosing the day after testing to ensure I'm at 0/0 before I add. It's strange because on Dr Tim's website one page refers to being done after both numbers are below .2 but another page says 0. I guess it's safer to make sure both are at 0. Would adding more Stability generate more nitrifying bacteria or I've maxed out after a week of using that? Thanks! Adding small amounts of Stability (or any other bacteria supplement like Microbacter) won't hurt, and might help. But you already have nitrifying bacteria in the tank and they're multiplying every day. You'll get there the same in the end. Lots of successful reefers regularly dose bacteria supplements. And lots don't. The challenge with so many of the "does this work" questions is that there are so many variables to consider, and so much of the effects only occur after weeks or months, that it's almost impossible to say for sure what caused what to happen. How many times have you dosed Ammonia now? I'm planning on dosing mine again once my Nitrites hit 0 but it's been 8 days. I didnt test yesterday, day before it was at 0.5 so hopefully today it's down to 0. I'm just curious how many more times I will probably need to dose to get to the point you are at now. Hi. I think you got to where I got way quicker than I did. I’ve been cycling my tank since 12/16 and dosed 10 times. Im still at 0 ammonia and .05-.1 nitrites. Seems to have slowed down in the last week however. If you do a waterchange, it will remove that tiny portion of nitrite. Once again, nitrite isn't toxic to marine fish. Thanks @teenyreef @Clown79. Just to clarify - I know you said nitrite is not toxic to marine fish, but it's true that they are an issue with inverts, correct? Regardless, I took a bit of a break from testing and I think it's finally cycled. Ammonia at 0 and nitrites appear to be 0 as well. With the red sea test kit, it was very hard to tell if it was clear or off-white/pink but when I shined a light down towards the vial it was definitely clear. So I wasn't sure if my eyes were playing tricks on me or what. So I think I'm good? Nitrates are at 160, so I will do some water changes to get that down. I'll definitely take the suggestion on opening a new thread for my build for future updates. I agree you seem to be in great shape, nice job!. And diatoms shifting to green algae is another sign that your tank is progressing through the cycle, into the ugly phase, and eventually on to the mature phase. Let us know when your tank thread is going so we can follow along! And yes, nitrites are more of an issue for inverts than for marine fish. But your test results look good to me. Thanks to everyone for their help in getting me started!